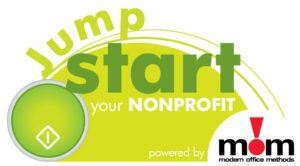 It’s that time of year again…Modern Office Methods’ (MOM) annual nonprofit campaign, Jump START Your Nonprofit, has officially launched registration today at www.momnet.com. This is the 8th year that MOM is running the contest for local nonprofits in Cincinnati, Columbus, and Dayton, OH. Local nonprofits have a shot at one of 3 – $10,000 office technology makeovers that can include: color copiers, black / white copiers, multifunction systems [copy/print/scan/fax], scanners, fax machines, document management systems, and managed network services. Registration is open until Wednesday, November 1 at 5pm. After registration ends, the MOM team will select 10 finalists in Cincinnati, Columbus, and Dayton. These 30 finalists will battle it out over a week of online voting. They will campaign on social media, at their charity events, and vie for the title of 2017 Jump START Your Nonprofit Winner. The top vote-getter in each city wins the $10,000 prize. Winners will be announced the week of November 20, right before the Thanksgiving Holiday. Check out the pictures below from last year’s winners with their big checks at The Rusty Ball in Cincinnati, OH. Who knows…maybe this year your favorite nonprofit could be holding up on of MOM’s big checks! Register today at www.momnet.com. Now that is really good initiative, although its been 8 years but I came to know about it for the first time. This looks perfect platform for people to come up with their ideas for non profit and bring it to reality. Great community offering great help for many people who are really in need of money, thank you for helping needy ones. Doing a great job.